Doug Phillips of Vision Forum has penned a delightful and meaningful blog posting about a blessed way to end this current year and prepare for 2012. I wholeheartedly recommend that you go to his blog and read his three points. They are timeless, good for any time of the year, and very poignant. Practicing these three recommendations will bring much peace to your life, and to those around you. Praying that you have a very JOYful and blessed New Year! Fun Family New Year's Eve Party Idea! For the last, well, umpteen years, our family has hosted a family-friendly New Year's Eve celebration. I wouldn't say we do anything exotic or extraordinary...but we always have a lot of fun! Yes, our girls now stay up until midnight (or later!) with us. I know - we're crazy. And this year, with New Year's Day falling on a Sunday, and our worship service at church starting at 10:45 on Sunday morning, me thinks we're going to have some very tired children - and adults - come Sunday afternoon. I love planning the food and decorations, but I've never been all that great at planning games and activities. When I saw this neat "New Year's Eve Countdown" idea on www.TheIdeaRoom.net, though, I knew this was what we were going to do this Saturday night. I mean, how fun is this? However, I wanted different colors for our own family's party. So...even though I don't do this as often as I'd like, I took some time to have fun and design a set of printables for you to have your own New Year's Eve Countdown for your own family - in shades of blue and silver glitter! All you will need are some paper lunch sacks, a black marker, and paper to print off the FREE printables, below. I happened to already have some white lunch sacks, so we're going to use those. If you don't happen to have lunch sacks, you could also print these off and glue/fasten them to envelopes with the slip of paper ideas placed one inside each envelope. On each bag/envelope, use the black marker to draw in the corresponding time of the event! For our party, I'll be having one bag for each 30 minutes of the evening together. 6:30 ~ Eat Italian food! 7:00 ~ Glowstick "Maffia" game outside for the children! 9:00 ~ Ice Cream Sundaes! 12:00 ~ Happy New Year! Noisemakers and poppers for everyone! The bags will have the graphics on them, below, and inside will be a slip of paper that explains what the activity will be, plus any additional supplies needed for that activity (if they will fit!). As you can tell, we'll have 9 bags lined up on the dining room table, and every 30 minutes, a child will be selected to open one bag to announce the surprise or activity! I'd love to know how your own New Year's Eve celebration went for your own family, or more ideas for how to plan a fun New Year's Eve party, family-style. Please share in the comments, below! And if you decided to go ahead and use these free printables for your party, please come back and let me know how it went! Free Gingerbread House Designs, Recipes, Crafts eBook! Isn't this darling? Learn how to make a delightful homemade gingerbread house with recipes, patterns, crafts, and other delicious homemade candy recipes with this free eBook available right now! If you don't have time to make something like this for this Christmas, save this for next year's use! Ouch. Poorly produced audio CDs just make me cringe. Especially when it's from a Christian ministry. I just know they're trying to do a great job - but they aren't succeeding. Either the script is poor, the audio recording isn't done well, or something. I guess I'm kind of an audio "snob." I can't stand to listen to AM radio stations, either. The extra fuzz and buzz just makes me cringe - some more. If you're anything like most American moms, you've bought or borrowed scads of audio CDs for your children to listen to while in the car or folding laundry or just to enjoy as a family. I know I'm not the only one who's engaged my children's imagination by reading to them aloud, and by borrowing or buying audio CD's for them. And since I discovered that my youngest daughter's weakest learning style was audio, I've made an extra effort to help her out in this department. When she was much younger, we purposefully listened to lots of audio stories and radio theater during breakfast, where she was sitting relatively still yet busy enough eating her meal...so she'd sit still long enough to be able to listen to a short story. Over the years, her auditory learning has greatly improved! We've listened to Bible narratives and dramas on cassette or CD, Adventures in Odyssey episodes, Focus on the Family Radio Theater stories like "The Hiding Place", "The Chronicles of Narnia", etc. We've avoided poorly done audios, because there are enough out there on the market that are professionally done. The hardest thing to find made professionally, though, has been true Bible narratives of the biblical record. I haven't been all that impressed with most of the Bible "stories" we've heard. Some of them are downright poor. 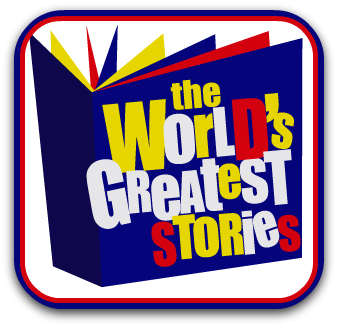 I heard that I might have the opportunity to listen to and review "The World's Greatest Stories" by George Sarris. Hmm. Was this worth my time? My girls were at the upper end of the age range for this review product (designed for ages 4-12). I decided to go check out the website, first. After listening to a sample of what George Sarris had to offer, I was hooked! No chipmunk-sounding voices, no weird background sounds/music. It sounded very professional! I signed up immediately, without even showing this website to the girls. I just knew that they would love what they'd get to listen to at home! Here's what arrived: Volume 1: The Prophets, in NIV format, and a sampler CD. The King James Version is also available. Why the choice between NIV and KJV? Well, instead of some written script that George Sarris has written himself or borrowed from someone else, he reads exactly through the biblical account, directly from the Bible. Some people might insert a yawn here. Obviously, you haven't listened to George Sarris recite the biblical record of a historical account! The package came in the mail, but the girls didn't see it arrive. At our evening family Bible time together, I put "The Prophets" into the CD player. At first, the girls looked at me strangely when they heard an audio CD begin to "talk." We usually read from the Bible and read through a Bible devotional most nights. One of the girls picked up the CD, and they both stared at the cover. I could tell that they'd already made a judgment about this CD just by looking at the cover. But you can't always judge a book (or audio CD) by its cover, right? Not more than a minute later, they were sitting forward on the couch, listening intently. So were Elmer and I. This was good stuff. Really good. George Sarris is a very gifted man. I've seen numerous live dramatic interpretations of biblical accounts, and some have been excellent, but this was powerful. Wow. We listened to "The Blazing Furnace". When it finished, we stared at each other in amazement. Never before had we heard one man use a variety of voices, inflections, volume levels, and sound effects before in such an amazing way! The girls asked if we could listen to another selection on the audio CD. It was getting late, so we decided to listen to the next selection the following night, which we did. Again, we were taken back by the power of God's Word told in a passionate way. It wasn't a bunch of strange vegetables singing goofy songs. It wasn't a group of kids attempting to figure out life and somehow weave God's truths into the "story." This was simply God's Words being clarified by a man very gifted for a godly purpose. Here's a sample of something similar to what we listened to, although I think the audio CD we listened to is much better, because instead of relying on some visual clues he provides for the audience in the video clip, below, the audio CD selections only have audio clues and cues, and they are much better. We were all very pleasantly surprised at how excellent these audio selections are delivered to the intended audience! Even though our girls are both in junior high, I think I'll consider buying some additional audio CDs from The World's Greatest Stories. Not only will we enjoy listening to some more of these, they will be excellent to use in working with younger children (teaching Sunday School/VBS/Awana), or for my own grandchildren some day to listen to them. Unless you decide that you don't particularly care for Mr. Sarris's style of reading through the Scriptures, I know that you will enjoy these! Each 60-minute audio CD costs only $7.95, and if a person orders 6 items, the shipping is free. Nice! I'm super impressed with The World's Greatest Stories, and so were many of the TOS Crew families who reviewed this product with me. Read what they have to say about The World's Greatest Stories! I received one CD copy of Volume 1: The Prophets in exchange for my honest review of this product. No other compensation was provided. Fractazmic by "I See Cards" Games! Recently, the girls and I received a new math fractions card game called, "Fractazmic". Not "Frazzled", which is probably the name Brittany (age 11) would have given it. Hee-hee! Not "Frustrating but Fabulous", which is the name I would have given this game when I was a child. Instead, it's Fractazmic! And it is a FABULOUS game to play at home to help children understand fractions better. Now it may seem from Brittany's renaming of this game that it was too hard for her and that it confused her. Actually, she's spending a lot of her math time this year learning about fractions, and she's found fractions to be a bit tricky for her at times. So her attitude may not be the best about playing a math game revolving around the concept of fractions. At first, she thought the game was too hard. But Fractazmic is actually for ages 7 and upward, so it really isn't too hard for her at age 11. It just makes her think harder than other games she's played, so for her, she categorized Fractazmic as "too difficult." Really, though, it's not. Not even for Brittany. Fractazmic, by "I See Cards", is purposefully designed to cause kids (and adults like me!) to use the 60 cards to convert fractions back and forth and to add fractions with nonequivalent denominators. Fractazmic makes the players begin to understand the concepts between fractions and measurements. Since Brittany's a smart girl, she did quickly figure out that she can use the pictures on the cards to help her make sets or "hands" to lay down. And that made the game easier for her, which was nice. When Brittany finishes her current math textbook in another 2-3 months, we're going to keep on playing Fractazmic occasionally to help her keep her fractions skills sharp. I know that she's going to get used to the game as time goes on, and will continue to play better and smarter! Want to see Fractazmic in action? Take a visit to a Fractazmic speed game where you can play it online! If your time is the fastest, you can even win a free set of Fractazmic for your family! And another version of Fractazmic...Trap! "I See Cards" also provides everyone with a free download of their booklet HERE which explains how to play the different games using the Fractazmic deck of cards. "I See Cards" sells Fractazmic for $6.95 and also sells other card games they've developed, including Pyramath (addition, subtraction, multiplication, and division) and Prime Bomb (prime numbers). It can be played individually or by 2-4 people. Nice that this game has that kind of flexibility! I'd personally much rather play Fractazmic during math class than do a worksheet. Wouldn't you? !!! We'll continue playing Fractazmic, and gaining more skill in quickly maneuvering back and forth between fractions that need to be added and subtracted. Games are such a better way of learning and practicing skills like this! I know Brittany will enjoy giving up a math assignment to play Fractazmic once in a while. So will Kelsi (age 14) and I! Want to see what other TOS Crew members had to say about the new card game, Fractazmic? Click here! Disclosure: I was provided with one free set of Fractazmic cards for the purpose of using and reviewing this product here for you. No other compensation was provided. Our 2011 Family Christmas Card! After a week of horrendous stomach flu and then a few days' jaunt to California for my uncle's memorial service, I've finally had some time to plan our Christmas cards for this year. I know, I know. Most of you have had your Christmas cards or letters ready since mid-October, right? Please don't tell me if you have. I just might cry. I did think about it, mid-October. But my grandmother passed away then, and we made our first jaunt to California for her burial service. We've had a busy, fulfilling few weeks around here, other than the stomach flu. That was NOT fulfilling, in the least! I decided to do what I did last year for our Christmas cards: use Shutterfly's photo and card site. In years past, I would type out a full-page letter, print it off, fold it, place it inside a Christmas card, sign the Christmas card and often write a little note to make it more personal, and finally stamp and send off the letters. Since we have around 75 people on our Christmas card list, it took me quite some time to do this. Last year, with Shutterfly, I was able to upload a family photo to a beautiful, professional-looking card, type out a full letter to be printed inside the card for me, and then have them shipped quickly to me. It was so nice not to have to spend a lot of time folding all those letters to stuff into the card envelopes! This year, we've done the same thing. I uploaded the photo you see above, and typed out a full-length letter for the inside of the card. Then, when the cards arrive, I'll sign our names inside, include a little handwritten note if I have time, and send our Christmas greetings on their way to friends and family! I've always been impressed with Shutterfly's easy personalized card-making and invitation services they offer on their website. Granted, I do enjoy dinking around on the computer and getting our family photo to look just how I want it. I enjoy typing out our Christmas letter, and all that goes along with it. But it's truly not difficult to navigate their website, and they hold my hand all the way through the personalized card-making process, so I love that! I wish I could send you all one of our personalized Christmas cards, but I can't. Know that I treasure you, my readers, and I sincerely wish you a blessed Merry Christmas! I received 25 free photo cards from Shutterfly in exchange for reviewing this process on my website for my readers. No other compensation was provided.